L shaped kitchen design is good for small and medium sized kitchens where the L shape can be conveniently placed and utilized. In case you want to use the L shaped kitchen designs for a larger space, remember to keep optimum lengths of the two legs. Keeping one leg very long would only increase the distance between cooking section and worktop areas. In L shaped design, the shorter leg can be utilized for keeping the cooking range while the longer leg can be utilized for sink or basin arrangement with refrigerator at its end. Appliances like microwave should also be placed on the shorter leg to synchronize food-related work on the same leg. So, the triangle would still exist but in this case you shuttle from refrigerator or sink to cooking area, while in U shape it would have been from the sink to refrigerator to cooking area. Remember to provide curved ends to the leg that begins from entrance of kitchen… as a pointy edge could hurt you. The space opposite to the corner of L shape can be conveniently utilized for keeping an island to be used as dining space. You can also opt for a small set of table and chairs depending on your requirement. L shaped kitchen design with island would be a good idea in case you have good space and would also like to add some extra storage in terms of stacking cutlery, table napkins etc. This may not be possible with a table and chair set, but would be good for small spaces. Do not over-clutter in either case as that can obstruct your movement around the L shape. Keep an island with two or three cabinets and three to four people seating arrangement. Cabinets in L shaped kitchen design should be extended along the lengths of the L shape. Use cabinets above cooking area up to the sink but not above it. Or if you do wish to stretch the wall cabinets along both the legs of L shape, place smaller height cabinets above the sink area to keep a comfortable work space around the sink. Cabinets above refrigerator space should be designed in accordance with the height of your refrigerator. Keep a good amount of distance while fitting it in that space else it may fit tightly and can also get scratches in the process. Another great way to utilize space in L shaped kitchen design is to use a long cabinet at the end of long leg. This would allow for more storage. However, it would work well for a large space where the long leg can be utilized for sink, refrigerator and a tall cabinet. Ventilation in terms of a window is helpful and should be used for placing sink so as to ensure faster drying of that area. In case there is no window, go for chimney ventilation above the cooking range to avoid suffocation and discomfort. 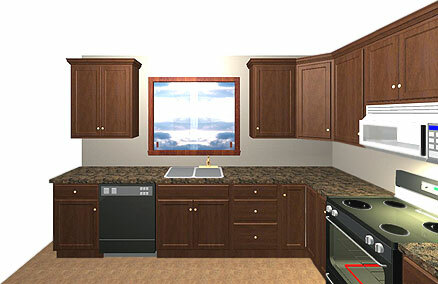 You can design and plan your requirements for an L shaped kitchen design through online layouts. This would help you place your appliances, wall cabinets, base cabinets and sink according to the space available, ease of use and comfortable working. You can also plan for a fixed or movable island according to space available. A movable island provides flexibility of space and allows easy movement in case of a small to medium size kitchen. However, in a larger kitchen, keeping a fixed island would help and serve as a temporary work area and for extra storage. Estimating what your kitchen space can accommodate or what it cannot, along with ease of everyday work, can help you design L shaped kitchen optimally. Do not over-clutter a small or medium size space and do not over-extend a large space. You can plan it with online layouts or even check with your local hardware shop. What are your thoughts on L shaped kitchen designs? Do you have a suggestion or comment about designing an L shaped kitchen? Please share your thoughts with us by filling in the comment form at the bottom of the page.